At the end of each night, attendees were invited to ask questions and share their stories about the need for better connectivity. One local resident shared his frustration that his family’s only option for Internet access is satellite while his neighbor has broadband, illustrating the inconsistency of broadband access in the state. 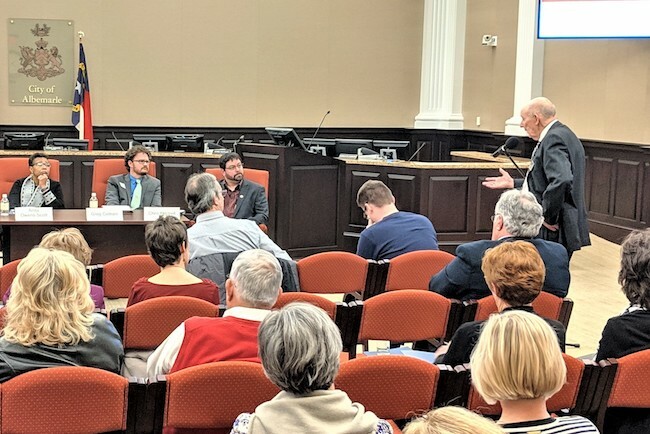 All North Carolinians deserve affordable, reliable, high-quality Internet access, and it’s our hope that the conversations that began at these meetings will result in meaningful progress toward that goal. If you are interested in hosting a similar event in your community, let us know at broadband@muninetworks.org! Thank you to our sponsor Ting who helped make Let’s Connect possible!